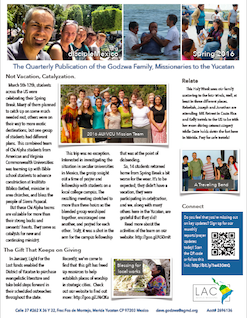 disciplemexico.org · Our Spring Newsletter is Available for Download! Our Spring Newsletter is Available for Download! Things are really heating up here in the Yucatan, and we’ve not even made to the the Spring Equinox yet! An update from our latest Chi Alpha visit. And updates from our family as we move into the new season. Spring is in the Air so is Our Newsletter! Get Set for Our Spring Newsletter! Summer’s Coming but Our Newsletter is Already Here!